When the Mount Vernon Board of Education met for its organizational meeting in January 2012, it was missing something very important: A copy of the oath of office. As even Chief Justice John Roberts could tell you, it’s probably better to have a copy of the oath in front of you than to try to wing it. Dr. Margie Bennett: Are you going to give us the oath of office? Steve Short: I don’t have it. MB: We may have to wait. … Because we won’t have a quorum. SS: We need to. Go ahead, and I’ll give it if that’s OK.
SS: We’re making this up as we go. MB: Is it legal, then? MB: Are you going to do us together, or do you want one at a time? You probably wouldn’t say the same thing three times. MB, Cheryle Feasel and Jody Goetzman: I do. SS: I hereupon decree that you are a board member of the Mount Vernon City Schools. Thank you. For you math folks, the oath reported in the minutes showed a 418.75% increase in word count over the actual oath administered. The board subsequently approved the minutes of the meeting. During research for this article, AccountabilityInTheMedia.com submitted a public records request for copies of the relevant minutes. Due to several tell-tale shadow lines around a group of signatures on the minutes of the organizational meeting, AccountabilityInTheMedia.com requested to examine the original at the school’s district office. The examination of the original document showed that the signatures had been physically cut-and-pasted onto the document. Research by AccountabilityInTheMedia.com did not find anything in Ohio law that specified that the oath was required to be signed or that signing the oath would substitute for a properly administered oath. Before entering upon the duties of his office each person elected or appointed a member of a board of education shall take an oath to support the Constitution of the United States and the constitution of this state and that he will perform faithfully the duties of his office. Such oath may be administered by the treasurer or any member of the board. I, __________________, do solemnly swear (or affirm) that I will support The Constitution of the United States and the Constitution of the State of Ohio; and that I will faithfully and impartially discharge my duties as a member of the Board of the Mount Vernon City School District, Knox County, Ohio, to the best of my ability, and in accordance with the laws in effect during my term of office until my successor is chosen and qualified. Both O.R.C. 3313.10 and board Bylaw 0142.1 include explicit reference to supporting the Constitution of the United States and the Constitution of Ohio. Although someone could attempt to argue that supporting the Constitution is implied through the words “the duties,” Ohio law makes a distinction between the wording and the content of the oath. The flexibility allowed in the form or wording of the oath would conceivably allow the second half of the oath’s content to be worded as, say, “I’ll never let you down.” That flexibility in the form of the oath, however, does not negate that both the Constitution of the United States and the Constitution of Ohio are included under the required content. Of possible relevance to the impact of an incorrectly administered oath are O.R.C. 3.01 (“Continuation in office until successor elected or appointed and qualified”) and O.R.C 3.22 (“Oath of office”). Two out of the three people given the oath in January of this year had been re-elected to the position. Assuming they had been given a valid oath previously, O.R.C. 3.01 would seem to allow them to continue in office. AccountabilityInTheMedia.com has requested comment from the Ohio Department of Education regarding the legality of the oath administered by Short. John Charlton, a spokesperson for the Ohio Department of Education, declined to comment on whether the wording used by Short complied with Ohio law. According to research done by a person from the Knox County Clerk of Courts Office, no one by the name of “Stephen Short” is listed as a notary public in Ohio. AccountabilityInTheMedia.com has requested comment from Judy Stahl-Reynolds, the school’s treasurer, regarding whether she administered the oath of office. Based on the information supplied by the school, what remains of the document signed is the signatures pasted onto the minutes of the organizational meeting. The Ohio Supreme Court announced today that oral argument for John Freshwater v. Mount Vernon City School District Board of Education has been scheduled for February 27, 2013. The John Freshwater case received an influx of new paperwork on Thursday as the Mount Vernon Board of Education and its cohorts submitted their briefs to the Ohio Supreme Court just in time to meet the extended deadline. Joining the school board were the American Humanist Association, Americans United for Separation of Church and State, the Anti-Defamation League, the Secular Student Alliance, the National Center for Science Education and Stephen and Jenifer Dennis. The group submitted a total of five briefs. In January 2011 the board fired Freshwater from his position teaching eighth-grade science at the Mount Vernon City Schools. He had been employed by the school since 1987. The board’s resolution firing Freshwater provided two categories of reasons for the firing: The first involved Freshwater’s teaching methodology which the board characterized as religious. The second was about “religious articles” in his classroom. Following his firing, Freshwater appealed unsuccessfully to Knox County Court of Common Pleas and then to the 5th District Court of Appeals in Ohio. Both courts rubber-stamped the board’s decision. In July of this year the Ohio Supreme Court agreed to hear Freshwater’s case. On Aug. 24 Freshwater submitted his merit brief to the court. According to court rules, Freshwater will have 20 days to respond to the recently submitted briefs. The board has motioned for the Ohio Supreme Court to strike the text of the First Amendment from Freshwater’s merit brief. Incidentally, the swearing in of three board members in January of this year utilized a paraphrased version of the oath which did not explicitly mention the Constitution of the United States or the constitution of Ohio. The omission of the Constitution from the oath may have been an innocent goof-up. The real test of elected officials' loyalty to the Constitution is not so much what they say they will do but what they actually do. Freshwater has argued that the basis used by the board to terminate his employment violated his and his students First Amendment rights to academic freedom. In the resolution firing Freshwater, the board took issue with how Freshwater handled the topic of evolution and with his encouraging his students to think about the material in the science textbooks instead of blindly accepting everything as written. The board, in its termination resolution, did not go so far as to claim that Freshwater emphasized the evidence against evolution to the point of outright teaching either creationism or intelligent design. However, in the board’s recent brief, it makes the claim that Freshwater’s merit brief acknowledges outright teaching of creationism and intelligent design. Contrary to the board’s new claim, a fair analysis of Freshwater’s merit brief would show that whenever a reference was made specifically to how he handled creationism or intelligent design his approach was characterized as being along the lines of considering or discussing the matter. This time the board decided to cite its policies. But, unfortunately for the board, those polices turned out to only support Freshwater’s arguments. So, how has the board exercised that authority through its written polices? The board did so primarily through adopting Policy and Guideline 2240 - Controversial Issues; Policy and Guideline 2270 - Religion in the Curriculum; and Policy 3218 - Academic Freedom of Teachers. Of particular relevance is policy 3218 which not only is titled Academic Freedom of Teachers, but also says, “The freedom to speak and share ideas is an inherent precept of a democratic society governed by the will of the majority. Teachers and students need to be free to discuss and debate ideas." The board was confident enough that the technique was working that it bravely went on to quote the rest of the same policy: "When ideas that may be controversial are introduced, teachers, while having a right to their opinion on the subject, shall state it as such and they should be objective in presenting various sides of the issues." That must mean that the school-approved science textbooks never mention ideas that are religious or that stray from current establishment-accepted thinking. The board is going to need the dark side of the Force. However, the board, as mentioned before, did not challenge that evolution was part of the topics the school allowed Freshwater to teach. According to the policy and guideline, once a controversial topic is allowed by the school, the teacher is then allowed to provide other viewpoints. Thus, the board’s argument rests on whether evolution is a controversial issue. If it were to be established that evolution is, in fact, a controversial issue, then the board’s defense would fall apart. 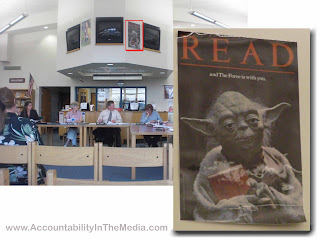 Of course, the board could always try to use the Force to levitate itself above the facts. C. When discussing a controversial issue, the teacher may express his/her own personal position as long as s/he makes it clear that it is only his/her opinion. The teacher must not, however, bring about a single conclusion to which all students must subscribe. D. The teacher should encourage student views on issues as long as the expression of those views is not derogatory, malicious, or abusive toward other student views or toward a particular group. 1. What is the person (group) saying? 2. What evidence is there that what is being said is true? 3. What is said that would lead you to think the position is valid? 4. What are the strengths and weaknesses of this position? 5. What do you think would happen if this point of view was accepted and was put into practice? 1. On balance, what do you think is the most reasoned statement? the most valid position? 2. What is there in the statements that supports your conclusion? What other things, beside what is being said, leads you to your conclusion? The very wording of the quote provided by the board does not preclude students from knowing about things that are not considered part of “the current body of scientific knowledge,” as, indeed, the schools own textbooks include information about past beliefs of scientists that are no longer accepted, even ideas that are religious. That Freshwater’s students understood science, and understood it well, is evidenced by his students’ high passage rate on the Ohio Achievement Test. The board also took the opportunity while on the topic of the controversial issues policy to criticize Freshwater’s 2003 “Objective Origins Science Policy” proposal. It would be ludicrous to suppose that anytime a legislative body, such as a school board, rejected a proposal that the act of rejecting it automatically created an antithetical policy. Surely Freshwater should have at least been afforded the First Amendment and academic freedom to teach within the school’s own policies and administrative guidelines. Another item included in the board’s resolution, in the teaching methodology category, was an allegation made by substitute teacher James Stockdale. Stockdale had testified during the state administrative hearing that in the fall of 2006 he heard Freshwater make remarks to his class about the subject of homosexuality. Freshwater, on the other hand, testified that he never made the statement that Stockdale credited to him. In a subsequent public records request made by AccountabilityInTheMedia.com, it was discovered that the school's records showed Stockdale's duties did not take him into Freshwater’s classroom anytime Sept. 1, 2005 through June 30, 2008. The board insisted that Stockdale did hear the comments. In other words, the board knows Stockdale heard the remarks because Stockdale heard the remarks. Aside from the board’s above-mentioned circular argument, the board is arguing that the records should not be considered by the court due to the fact the records were not submitted into evidence during the hearing. The final reason the board gave for firing Freshwater was that he did not remove all of the “religious articles” from his classroom. Freshwater, however, did remove all the items he was directed, in writing, to remove with the exception of his personal Bible. In contrast to the school’s directive regarding Freshwater’s Bible, the school has been allowing other teachers to each have a Bible out on their desks. In response to this disparity, the board mentions the testimony of Steve Short, superintendent of the Mount Vernon City Schools. Short said the difference was that parents Stephen and Jenifer Dennis complained that Freshwater referenced his Bible during class. 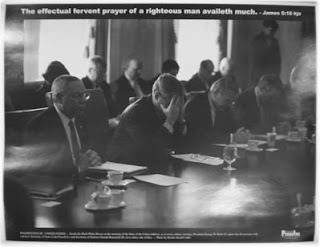 The “fervent prayer” poster, more commonly known as the Colin Powell/George W. Bush poster, had been on the wall in Freshwater’s classroom for years. Various faculty members at the school also displayed the poster at one time or another. 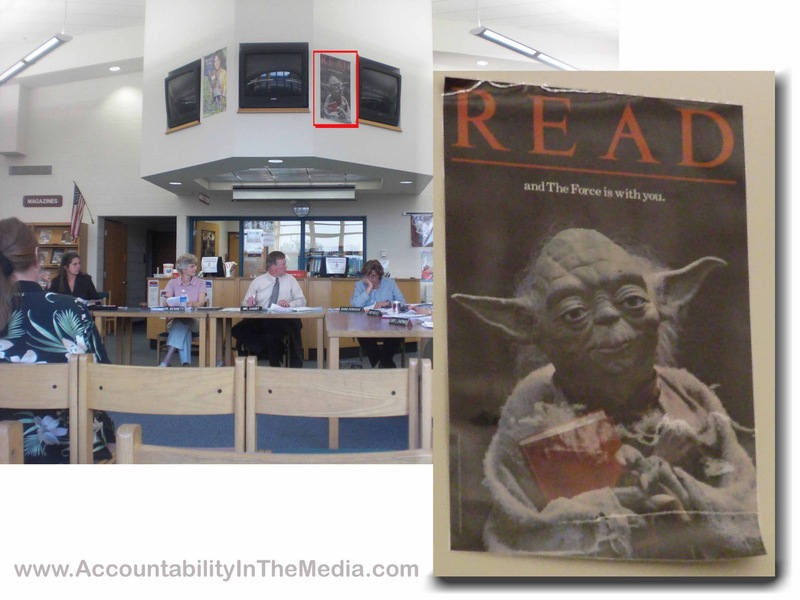 The school did not document any order to remove the poster. The school library does not have any signs warning that checking out books could result in expulsion. Excerpt from Freshwater’s appeal in Knox County Court of Common Pleas, examples from school science textbooks. PDF.